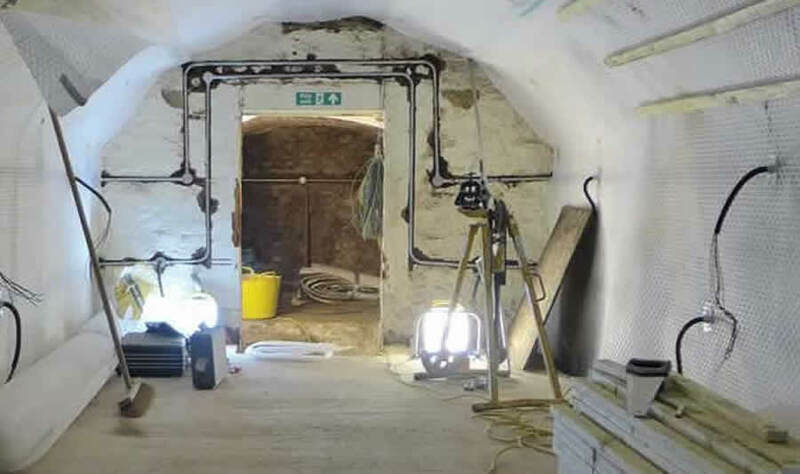 If you have a basement or cellar in your London property that is no longer in used because it is either wet or damp, then our damp proofing team at London Damp Company can fix this for you. Most brickwork in London properties is porous and has the tendency to absorb water. In most new build properties, cavity walls are now being used as a standard which ultimately prevents water from entering your property. However, some properties have rooms built underground these are known as basements or cellars, which is quite commonly seen in London. Having a basement or cellar, of course, can provide extra space in your property, but also quite comment for absorbing moisture as they are underground. In areas across London with poor drainage or high water tables, this can cause the basement or cellar to remain permanently damp. Waterproofing a London basement or cellar involves the application of a non-porous material, ultimately a waterproof coat. This process of creating a waterproof coat is known as “tanking”. Basement Waterproofing is a term used for all forms and methods of waterproofing when attempting to keep a basement or cellar dry. This includes the installation of Cavity Drain Systems. Basement Tanking is a technique where the application of a membrane to the inside or outside of the property to prevent water from entering. This type of application is defined as ‘Type A’ waterproofing. It is possible to waterproof or to give it the technical term, tank, any subterranean rooms that you might own, and make them fit for use once again. We do this using the Vandex Tanking System. Tanking your basement or cellar is a simple process. Firstly we would remove all the plasterwork and damaged masonry, exposing the original brickwork, concrete or masonry of the building. If you require any further information or would like to speak to someone then why not drop us a call or upload pictures to our website and we can discuss with you the best options to get rid of damp in your property on 0207 127 6886 or contact us. Specialists in Chemical damp proofing, Specialist plastering, Tanking systems, Cavity Drainage, Structural waterproofing. FREE inspection reports, detailed reports and quotations. Enter your details and one of our damp proofing specialists will call you back. Or phone us on 0207 127 6886. Your details will only be used by London Damp Company and are never passed on to marketing organisations. How to get rid of damp on the wall? No obligation damp survey with detailed reports and quotes. We also offer a 10 year insurance backed guarantee.